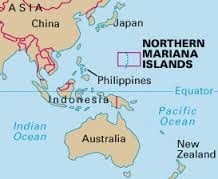 The Northern Mariana Islands, officially the Commonwealth of the Northern Mariana Islands (CNMI; Chamorro: Sankattan Siha Na Islas Mariånas), is one of the five inhabited U.S. island territories (the other four are Guam, Puerto Rico, the U.S. Virgin Islands andAmerican Samoa). It is one of two territories with "Commonwealth" status; the other is Puerto Rico). It consists of fifteen islands in the western Pacific Ocean, about three-quarters of the way from Hawaii to the Philippines. The United States Census Bureau reports the total land area of all islands as 183.5 square miles (475.26 km2). As of the 2010 census, the Northern Mariana Islands had a population of 53,883, of whom over 90% live on the island of Saipan. Of the 14 other islands, only two – Tinian and Rota – are permanently inhabited.